If you've been outside after dark the past month and had clear skies to the east, you must have noticed the planet Jupiter, the brightest nighttime "star" right now. It's near the red giant Aldebaran, which makes for a pretty pair. On Christmas day the Moon swept close to Jupiter in the sky, and in fact observers in South America could watch the Moon actually pass in front of the planet. Astronomer Rafael Defavari had his telescope set up to record it. The first part of the video shows Jupiter disappearing behind the Moon, while the second part shows it emerging from the other side. This sort of alignment, called an "occultation," isn't especially rare. The Moon and planets lie on roughly the same plane in the sky so they line up occasionally (though not exactly the same plane, or similar occultations would happen several times a month). Still, I found this video unexpectedly beautiful and moving. For me it drives home the truth that we really are sitting on a round rock in space watching other rocks and balls of gas circle the Sun in a cosmic dance. Though the video is silent, I couldn't help but hear the soundtrack from "2001: A Space Odyssey" in my mind (specifically, Ligeti's Lux Aeterna, though another piece may pop into yours). Look up once in a while and enjoy the dance. 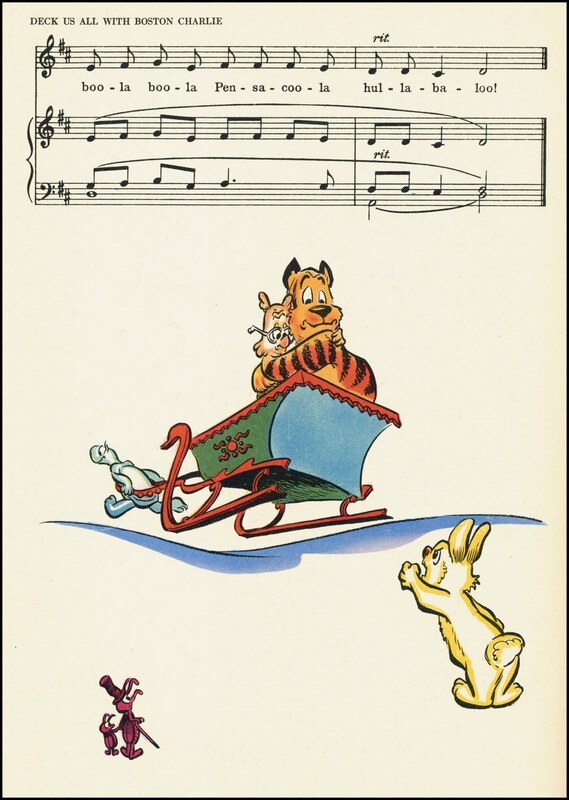 Long-time readers of my blog know what's coming, a Christmas tradition here since ought-six. Merry Christmas and Happy New Year to all, and thanks for being my friends and reading my stuff. 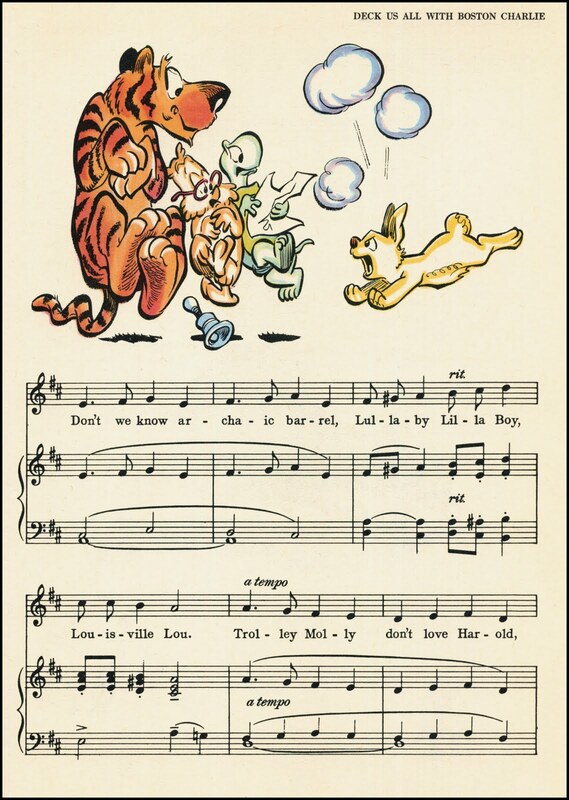 Polly wolly cracker n' too-da-loo! Antelope Cantaloup, 'lope with you! Harum scarum five alarum bung-a-loo! 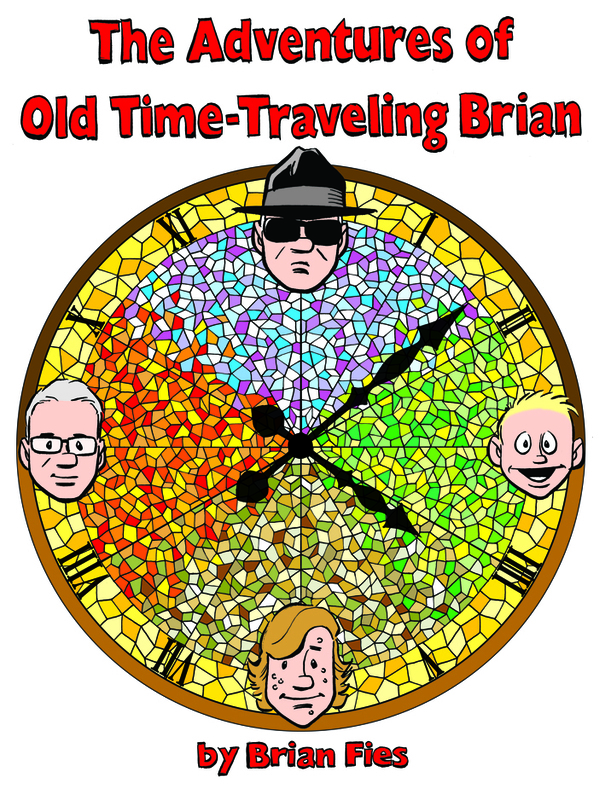 It took longer than I hoped and more work than I expected, but at last I'm happy to offer a special, limited-edition collection of the Adventures of Old Time-Traveling Brian, the dopey webcomic I began posting to my blog last summer. That's the cover above. This 20-page zine includes the six comics posted here, a seventh comic I made exclusively for the zine, plus some new art (I'm very proud of the title page!) and surprise bonus features. Its price is $5.95 for deliveries in the United States and $7.95 elsewhere (including postage) via the handy PayPal button below. If you can't or don't use PayPal, e-mail me privately and we'll work something out. When I say "limited edition" I mean it. There are exactly 50 of these zines in existence. I'm keeping five for me and my family, leaving 45 that I've signed and numbered (in pencil, almost as if they were actual works of art!). There'll never be any more. 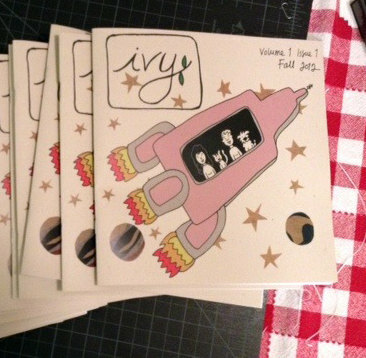 Zines are deliberately home-spun, rough-hewn, do-it-yourself publications, with varying levels of sophistication. I guess the prototypical zine consists of a stack of photocopied (or in the old days mimeographed) pages folded in half and stapled together. I tried to class mine up a bit. First, instead of standard 20# 8.5 x 11-inch printer paper, I used a very heavy (32#) legal-sized paper, making the completed dimensions 7 x 8.5 inches (~18 x 21.5 cm). I originally wanted to do the cover in a beefy watercolor paper with terrific texture; after an initial test printing went well I bought two big pads of the stuff, only to find that it didn't want to go through my printer anymore. Instead, I printed the cover on two-ply plate Bristol board, exactly the same paper I draw all my comics on, which seemed very appropriate. It looks sharp. Anybody want two big pads of watercolor paper? My zine-making Bible was a blog post by cartoonist Jim Rugg cryptically titled "How to Make a Zine." Jim did something I hadn't seriously considered until I read his post, which was printing the entire job on his home inkjet printer. I assumed that would be prohibitively expensive, but when I estimated the costs and took advantage of inexpensive off-brand ink like Jim did, it became pretty attractive. Best of all, doing my own printing let me use my own paper (which I also got at a close-out price) and maintain total quality control. Which is not to say they're perfect. A few pages are crooked, a few spines stapled off-center. About 20 copies have extra holes where I had to pull out their staples, swap out pages and restaple them, because that's how many I made before I noticed I'd numbered a page incorrectly. I encourage you to regard such imperfections as "charm." Zine-making in progress on my kitchen table. 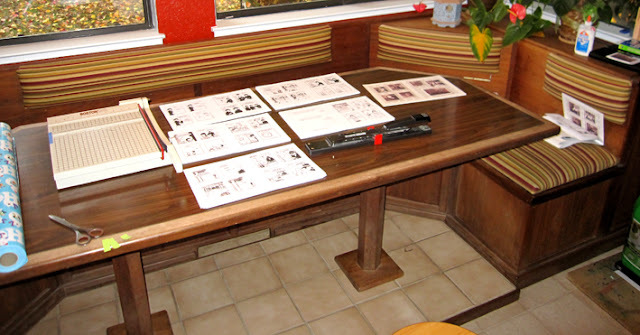 Papercutter, interior pages and cover, long-arm stapler. Elmer's glue on the seat back at right, above a few completed zines on the seat below. At lower right is a green 35-pound jug of kitty litter atop a drawing board that I used as a flattening press. And at the left is a roll of Christmas paper because as soon as I move my garbage out of the way this is also where we wrap gifts. It's a good table. I realize the price I'm asking isn't cheap for a zine but trust me--I ain't getting rich. Because I used such high-quality paper, these suckers are heavy and will cost a lot just to mail. There's a special thing in the book I had to buy 50 of (which helped me settle on the size of my print run). My wastage was unexpectedly high--not your problem, I realize, but the number of pages I recycled for poor print quality or stupid errors like incorrect numbering was large. If I sell every zine, I'll just about cover the cost of materials. My labor is free--my gift to you. 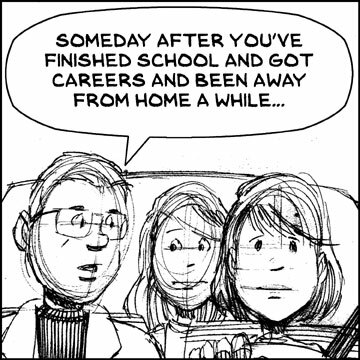 "In contrast to making a graphic novel, which can take years with little feedback or reward, I could write, draw, and post a new Adventure to the Web in a day. I think of these as 'good honest comics': funny words and pictures, no gatekeepers, no deep strategy or goal. They're sincere. Offering them as a zine is a natural extension of that aesthetic. "Producing these silly little stories stretched new creative muscles and made me a better cartoonist, and I appreciate your indulence. It was fun." THURSDAY NIGHT UPDATE: I've now mailed off all the orders I received (except for a few I'll be delivering in person--you know who you are), and they should fight their way through the holiday mail in a few days. If you think you ordered one and it hasn't arrived in a week or so (longer outside the U.S.), let me know. The response has been terrific. Still got a few left. Thanks again! Organizers of the Fourth (!) International Conference of Comics and Medicine have now set a time and place, and issued a Call for Papers. The date is July 5-7, 2013, the venue is Brighton and Sussex Medical School in the U.K., and anyone interested in presenting a paper or running a workshop needs to read the Call for Papers available here. 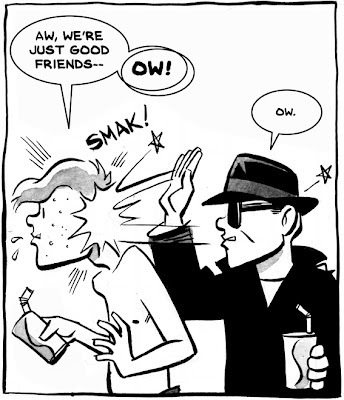 My six loyal readers will recall that I was a keynote speaker at the first Graphic Medicine Conference in London, then joined the committee that organized the second and third conferences in Chicago and Toronto, respectively. After each conference we worried that we'd be unable to recapture "lightning in a bottle," only to make the next one even bigger and better. Guest speakers have included Darryl Cunningham, Scott McCloud, Phoebe Gloeckner, David Small, Joyce Brabner, Joyce Farmer, and Paul Gravett, who's attended every one so far. They're pretty great events! Which makes it hard to explain why I resigned from the organizing committee after Toronto. As I told the others on the group, each of whom is a great person and friend, it just seemed like the right time. 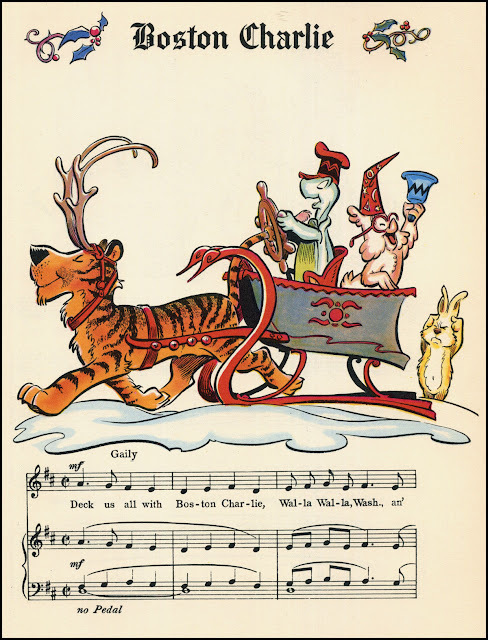 The committee had grown to an unwieldy size--just try finding a good conference-call time across eight time zones!--and I thought I'd contributed all I could. When I first signed on, there'd only been one conference and nobody knew what they were doing; after three very successful conferences, the group had several people with invaluable on-the-ground experience, and I wasn't one of them. I had some personal reasons related to time and expense, including the unlikelihood I'd be able to make it to England next summer. Like I said, the time seemed right. Notwithstanding our extremely amicable separation, I enthusiastically endorse these conferences as a terrific way to spend a few days, meet good people, and charge creative batteries. I'll continue to support them however I can, including an occasional news update here, and wish those still doing the heavy lifting nothing but the best. I've been remiss, and almost forgot to keep a promise. Actually, that's less a teaser than pretty much the whole thing. I stink at marketing. But the booklet's got 27 other pages of stuff from other people, too, and as you're distributing your holiday charity among various kettles and barrels please consider this good cause as well. For the Children 13 is now available here: $20, with all proceeds going to the Boston Children's Hospital. Thanks again to Jordan for letting me be a part of it! Yeah, I hear that Underwater Welder is pretty good. Funny, having my own book recommended to me. Also a little spooky how well their computer algorithm knows me . . . 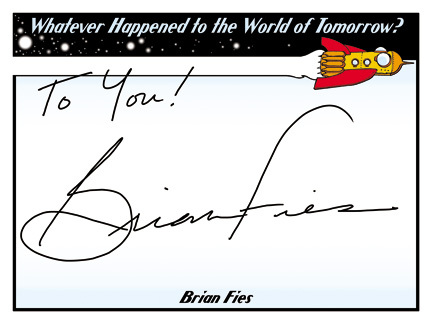 I don't know how it happened so quickly, but it's again that time of year when I beg friends, family, fans, and random passers-by to consider picking up Whatever Happened to the World of Tomorrow as a Christmas/Kwanzaa/Hanukkah/Solstice gift for the Space-Age Boomer or curious kid in your family. The new paperback is a real bargain! As I have since the hardcover came out, I'm happy to offer a signed bookplate FREE to anyone who asks, giving you an autographed book without you and me going to the trouble of actually mailing a book back and forth. Just e-mail me your postal address via the "About Me" profile box at upper right, tell me if and how you want it inscribed, and I'll put it in the mail for you the next day. Stick the bookplate inside the front cover (or wherever) and you can have a signed book wrapped and under the tree in a week. This offer is good anytime (not just Christmas) while supplies last, which at the rate I'm unloading bookplates will be about April 2037. Just about the best compliment I can get is when a reader likes one of my books enough to buy it for someone else. My sincere thanks. I'm seeing little geographic clusters in my visitor count and have received a couple of e-mails that tell me some college students are reading Mom's Cancer in class. You might think I'd already know that, but I really have no way to track who's reading (or assigning) my book unless they tell me. My ignorance is fathomless. Anyway, it's an honor--one of those neat honors I never get used to--and I just wanted to mention that I'm readily available to answer questions about my book(s). My e-mail link is in that "About Me" profile box at upper right, or you can leave comments on the blog. I won't write your entire essay for you, but I'll reply as honestly and completely as I can. Thanks, and thank your teachers for me. I appreciate it. To assuage my gnawing guilt for not blogging enough (day job, worked all weekend, etc. etc. ), today I reach back to a little obscurity I posted to the Web in 2007. I did this comic for a website started by a friend in the hopes it would build a neat community where creative people could share their work. It didn't. 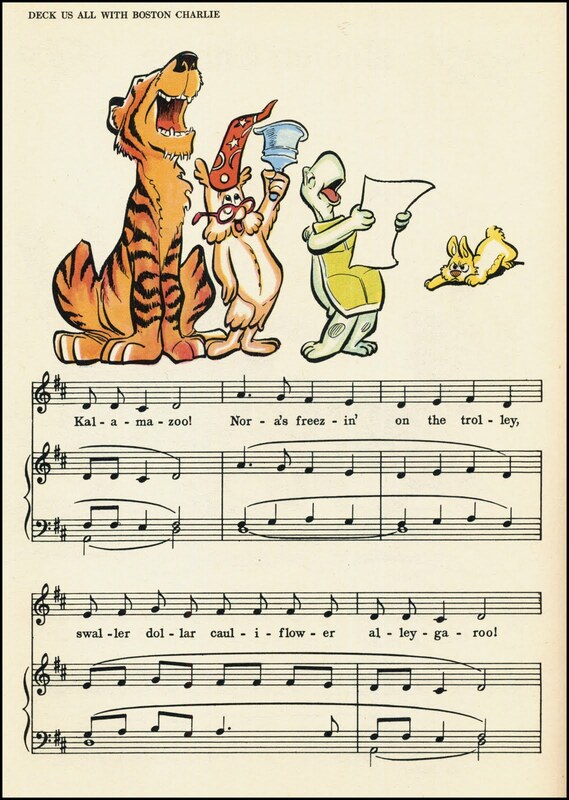 Probably fewer than a dozen people have seen this. This sketch of an actual conversation with my girls dates to their freshman year of college. They've since graduated (with honors!) and I wonder if they remember it at all. Regardless, it still holds true. From now through the end of the year, I'll likely be huddled deep in the Work Cave. Just want you to know it's not you, it's me. 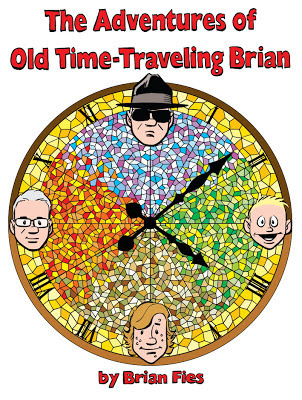 BTW, I still have every intention of making a fun little zine of "The Adventures of Old Time-Traveling Brian" but need to string together a few hours to finish my last bits on it. Soon, I hope. That would be a satisfying accomplishment. I recently got an e-mail query that prompted me to look up and repost this piece from March 2010 on "breaking in." I think it's still a good answer. Best of all, the links and embeds still work. This is just about all the advice I've got. Do whatever it is that only you can do; be persistent and lucky. If there's more to the secret than that, I don't know it. You don't need a map. You need to figure out what you've got and capitalize on that. Instead of bemoaning the fact that you can't mail in something that a publisher wasn't going to read and wasn't going to buy, try to figure out something else, something that builds off your skills or knowledge or contacts or whatever . 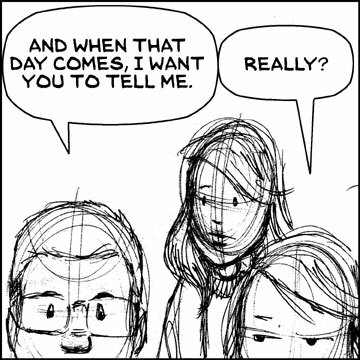 . . Make comics, not just proposals—even making crappy comics that convince you that you never want to draw another background again in your life will teach you more about telling a story in pictures on paper than a zillion proposals in the slush pile. Kurt's a zillion times more experienced and successful than I, but my observations match his. He offers examples of how colleagues of his got published--each unique, none following any formula. Same for the writers I know. When people ask me for advice, I sincerely don't know what to say. I can describe how I did it, but that's nearly useless because it's not replicable for anyone else in any other place or time. I'm reminded of Carl Sagan's line, "If you wish to make an apple pie from scratch, you must first invent the universe." 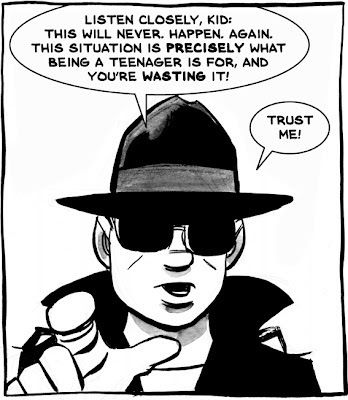 If you want to do it my way, you're starting a few decades too late. All I can suggest is: First, do the work. It's surprising how many "writers" never actually write and how many "artists" never draw. Having an idea for a thing is not the same as sitting down and creating an actual thing! The latter is orders of magnitude harder. Then get it out into the world any way you can. Print it up, show it to people, send it to editors, put it on a website. Find communities of people doing the same thing--easier than ever on the Internet--and share work with them. One of those people in your favorite web forum could be looking for a writing partner or content provider five years from now. Plant a hundred seeds and two or three will bloom--and they'll probably be the ones you least expect. Also, don't take without giving back in return. Don't expect or demand favors. No one owes you anything. Few people are as tiresome as a newbie who pops up to announce, "Hey, everyone look at my great stuff," argues with well-intentioned critiques, insults pros whose work is obviously worse than theirs, and then vanishes into a billowing cloud of entitlement. Bad form, and people have long memories. If you're polite, thoughtful, professional, and take the time to show others you care about their work, some will bend over backwards to help you. While determination is important and admirable, I'm not a huge proponent of the "winners never quit" school of success. 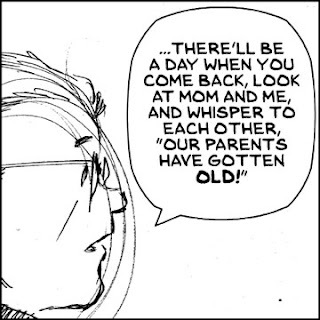 Busiek writes about a guy he sees at every convention who's been trying to break in for decades and will simply never be good enough to make it. I know people like that. I've also had times when I've wondered if I'm that guy. It's a fine line, deciding whether to keep slugging away versus recognizing that maybe that brick wall isn't budging and you're better off trying another angle or something else entirely. 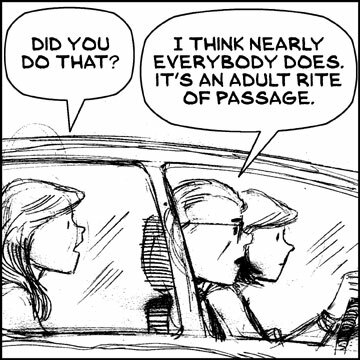 My criterion is external evidence of progress. At first, probably no one will respond to your stuff at all. Then maybe you'll get a nice note from a stranger. Then maybe some encouragement from a pro. Then maybe an editor invites you to send some material. You sell a little thing to a little client, then parlay that into selling a bigger thing to a bigger client. 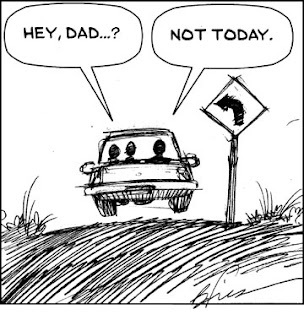 Look for signs of advancing toward a goal rather than running in place. Write without pay until somebody offers pay. If nobody offers pay within three years, the candidate may look upon this circumstance with the most implicit confidence as the sign that sawing wood is what he was intended for. Saturday was Neil Armstrong Remembrance Day aboard the USS Hornet Museum. In addition to a full afternoon of programs, the event featured the reopening of the ship's Apollo Exhibit, documenting the Space Age and Hornet's service recovering Apollos 11 and 12. See the previous two posts to understand why I care. I surprised my daughters, Laura (the museum collections manager) and Robin (Hornet volunteer and loyal assistant), by driving down for the big unveiling. The Apollo Exhibit was scheduled to open at 3 p.m. I showed up around 1 p.m. and poked my head in the door; they were startled and happy to see me for about 10 seconds and then put me to work. They still had a lot to do. 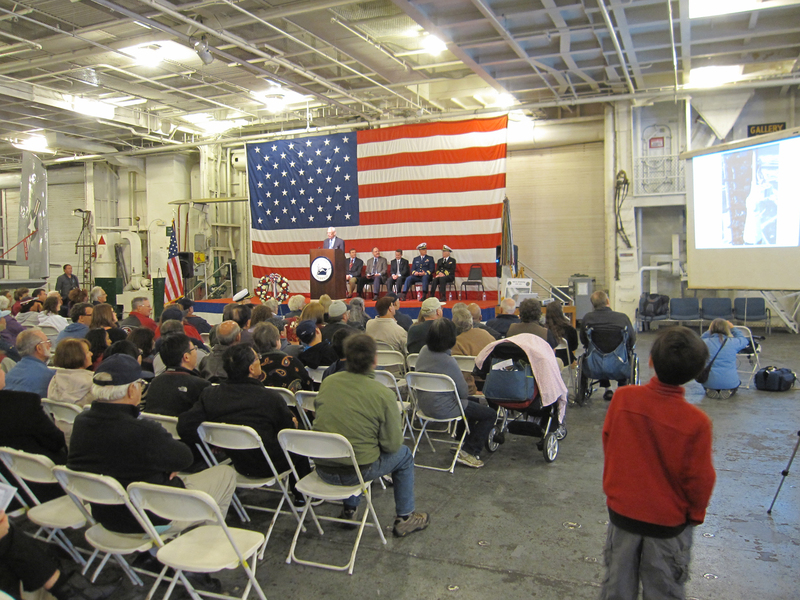 We polished everything as best we could, grabbed a quick lunch on the historic carrier's Flight Deck while watching a series of impressive ceremonial flyovers by vintage aircraft, then ran back down for the ribbon-cutting. 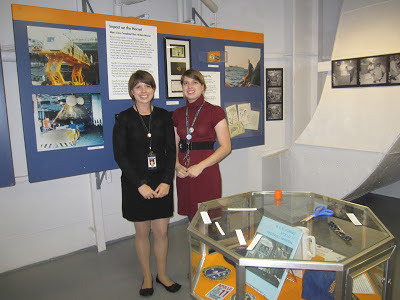 Some of the ceremonies in honor of Neil Armstrong. The speaker is Apollo Flight Surgeon Dr. William Carpentier, who later did us the honor of cutting the ribbon on the Apollo Exhibit. About an hour before the grand opening: Chad sweeping up while Laura, friend and fellow museum master Erica, and Robin caption photos, arrange artifacts, and clean cases. 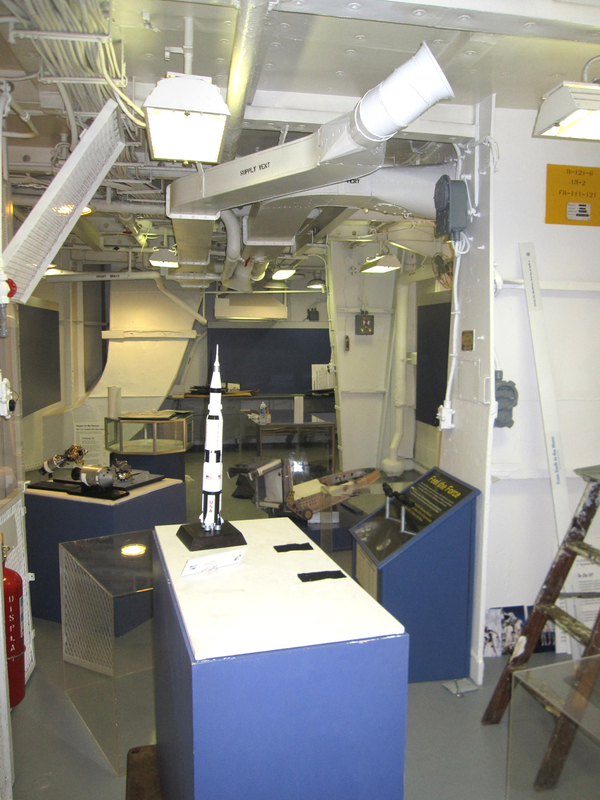 The exhibit entrance, with the 8-foot Saturn V model in place. 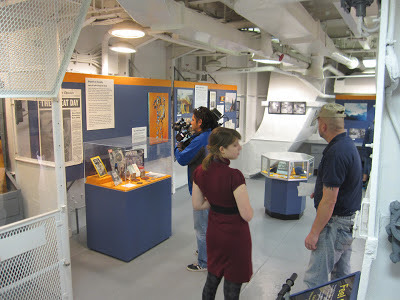 Laura and Chad giving a pre-opening tour to a cameraman from one of the Bay Area TV news stations that covered the event. Finally! Open to the public! Some of the first real-life kids to try my Gravity Box, comparing the gravity of the Earth and Moon. Folks seemed to have fun with it and get the point. I kept waiting to hear a metallic "sproing-kaboom" as the box broke and possibly exploded, but it never did. Success! Robin and Laura. The slips of paper on the octagonal case are artifact labels yet to be placed. Stop dawdling and get to work! I shot two videos. The first is of the ribbon-cutting remarks by Museum Trustee Ken Winans (I missed the first few seconds). My favorite part is the audible gasp among the onlookers when the big doors open. The second video--worth watching only for those who really care, trust me--is a seat-of-the-pants tour of the exhibit I did 10 minutes before it opened. I know one eagle-eyed viewer (sigh...Jim) will catch something that isn't in the video: the two iconic wood signs attached to the Mobile Quarantine Facility during the Apollo 11 and 12 recoveries (which I wrote about a while back). The custom acrylic case ordered to house them did not arrive in time. Those signs are in my opinion the Crown Jewels of the Hornet's collection, and will be displayed at the very back of the room so that visitors see them from the entrance. Just a bit disappointing, although the "Hornet +3" sign was on display in a case out on the Hangar Deck, so all was not lost. Came across a few more photos of our work on the USS Hornet last Sunday (see previous post) that I wanted to share. I know these may not interest everyone, but it's a topic that excites me on many levels: space history, creative expression, teaching, storytelling, parental pride--mostly, just getting to play with cool toys. "I walked on the Moon. What have you done?" 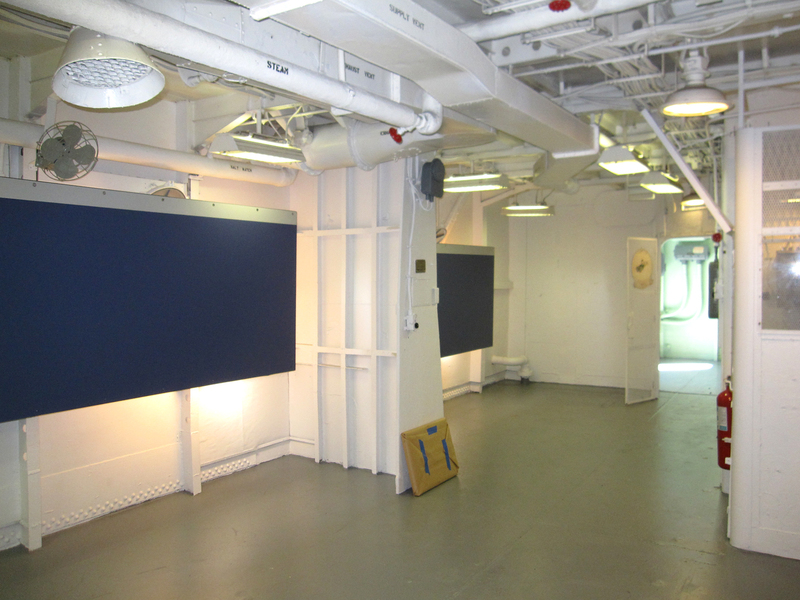 I built a space museum on an aircraft carrier. What did you do? The Apollo Exhibit gallery space as we received it, freshly painted. This view is from near the far end looking back toward the foyer through the open door. 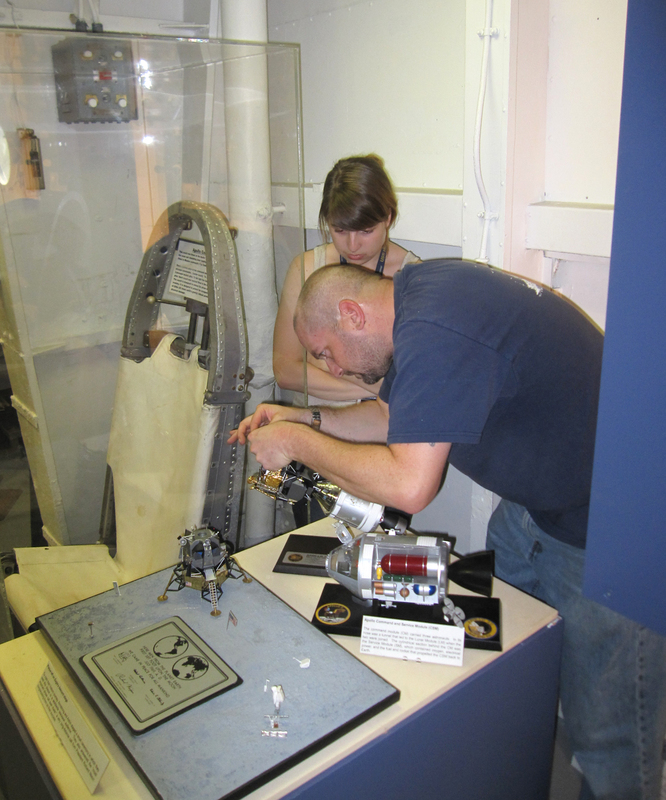 Laura and Chad delicately repairing a Lunar Module model that had gotten some dings over the years. 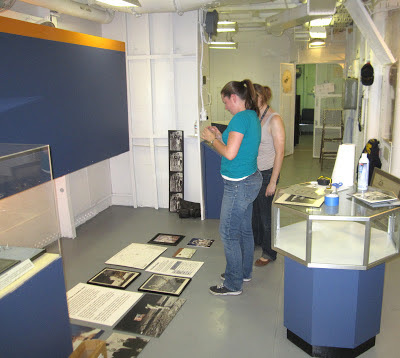 Laura (in back) and her friend and fellow museum master Erica laying out one of the display panels. 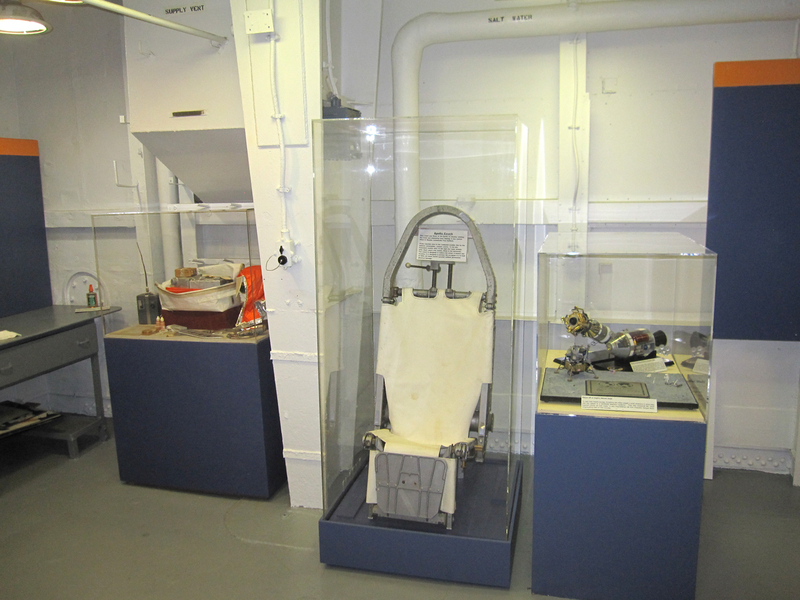 These three display cases hold (L to R) an Apollo-era astronaut survival kit, astronaut Tom Stafford's seat from Apollo 10 (as Jim noted in the last post's comments, one of the three fastest pieces of furniture in history), and those models Laura and Chad were working on. If you're ever in the San Francisco Bay Area and have any interest in space or military history, I can't recommend a trip to the USS Hornet in Alameda enough. I obviously love the old gray gal. I hinted on Facebook that I'd spent much of last weekend "where they keep the nuclear wessels" which, as fans of Star Trek IV already know, is the former U.S. Naval base in Alameda, Calif., where they also keep the (non-nuclear) USS Hornet. 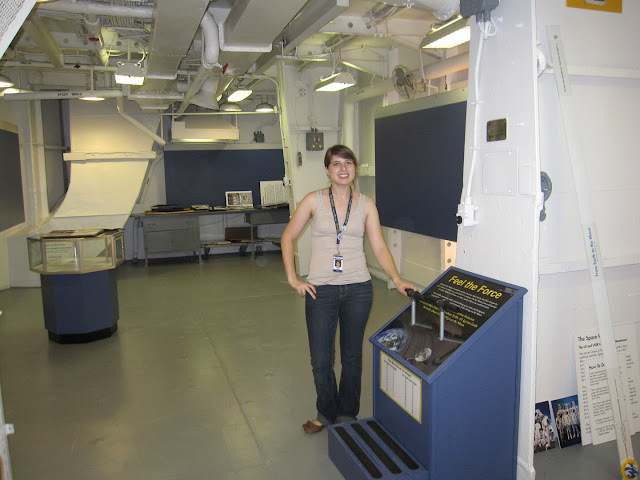 My six faithful readers may recall that my daughter Laura is the Archival and Collections Manager for the Hornet, an aircraft carrier commissioned in 1943 that served in World War II, Korea and Vietnam before recovering Apollos 11 and 12 from the South Pacific in 1969. It was decommissioned in 1970 and became a museum and National Historic Landmark in the '90s. 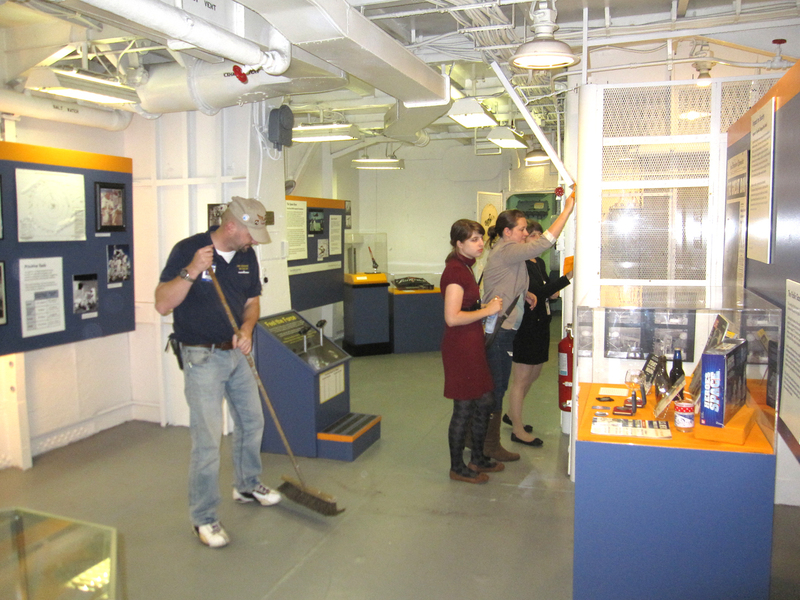 Several months ago, Laura asked permission to redo the ship's Apollo Exhibit, which was well-intentioned but not well-organized or -curated. The Hornet had some very neat Space Age material but didn't really explain its context or significance. Laura thought she could apply her master's education (not quite completed) in Museum Studies to build a first-class modern exhibit that would capture visitors' interest and tell the Hornet's Apollo story right. First thing she did was call the dorkiest space nerd she knew: me. One of my tasks was to help her dig through the ship's collection to identify the coolest stuff. 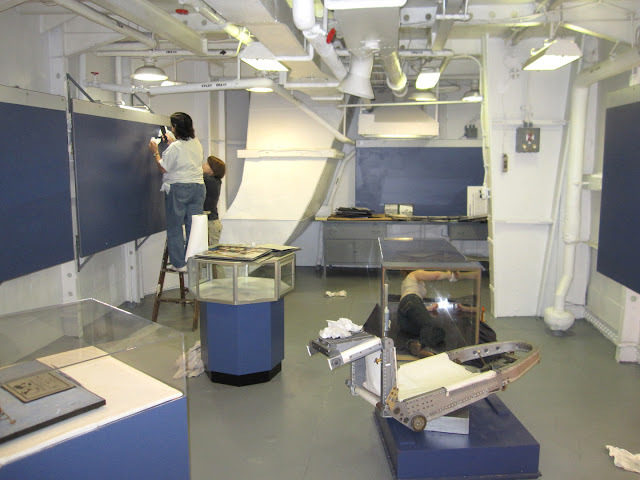 We started planning the exhibit in the space alotted to it, basically one long compartment and a small entryway off of the Hornet's Hangar Deck, while the ship's volunteers cleared, cleaned, and repainted the room. That took a couple of months. Meanwhile, Laura and I sorted, built and drafted, with the advice of the dorkiest space nerd I know, Friend O' The Blog Jim O'Kane. Our constraints: working within the given space without altering a molecule of it (after all, the ship itself is the museum's most priceless artifact), using five display panels already installed, and spending a minimal budget (supplemented by a generous donation from Seahorse Systems and its proprietor Jim O'Kane). Sunday was Install Day. Or, as my wife Karen calls it, the Day I Got My Garage Back. We transported a lot of stuff from home to the ship, most significantly a display case I painted for Laura and a "Gravity Box" I built to let kids pull handles to feel the difference between the force of gravity on the Earth and Moon. Laura, Karen, I, and Laura's sister Robin, who volunteers aboard the Hornet in other capacities, gathered dockside in the morning to make a museum. 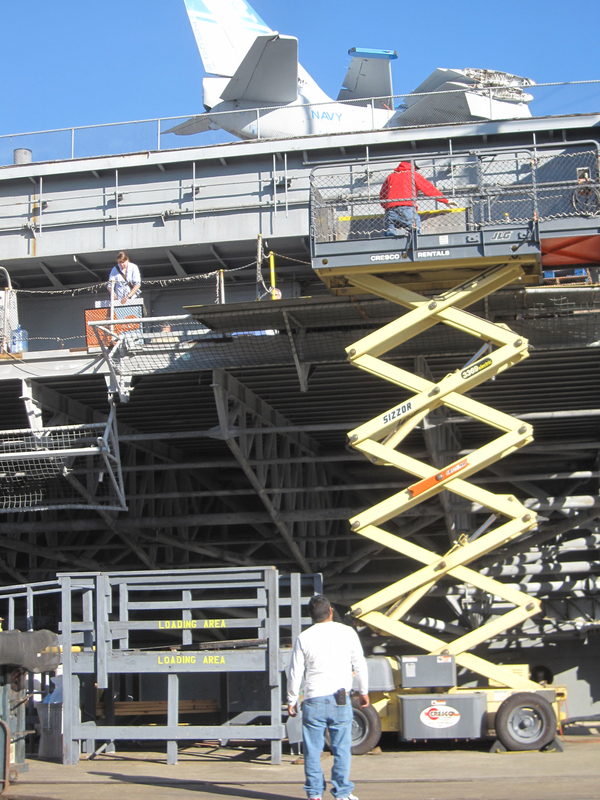 How you get stuff too heavy to roll up a gangway aboard an aircraft carrier. Laura's at the top left, I'm up there somewhere (not the guy in red; he's running the scissor-lift, which only a fool would let me do). 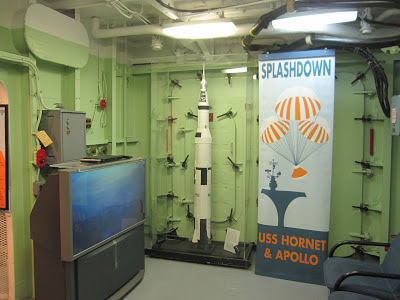 A nice overview of the back half of the Apollo Exhibit space. Boss Laura poses with the Gravity Box I built: pull on the left handle to feel how heavy 24 pounds is on Earth, pull the right handle to feel what the same mass weighs on the Moon (4 pounds). All units also presented in metric. 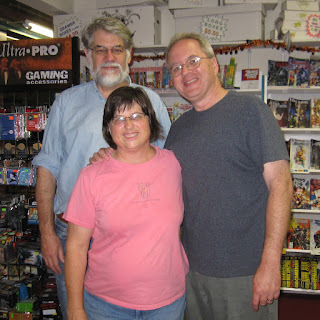 At center left is a neat octagonal display case Laura bought on Craig's List and I painted blue. Barely visible at right, leaning against the bulkhead, is a long skinny model I built showing the Earth, Moon, and distance between them to scale. 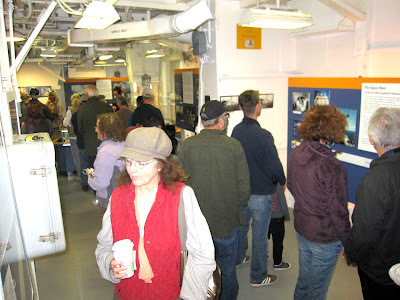 This is the entryway, or foyer, to the Apollo Exhibit. 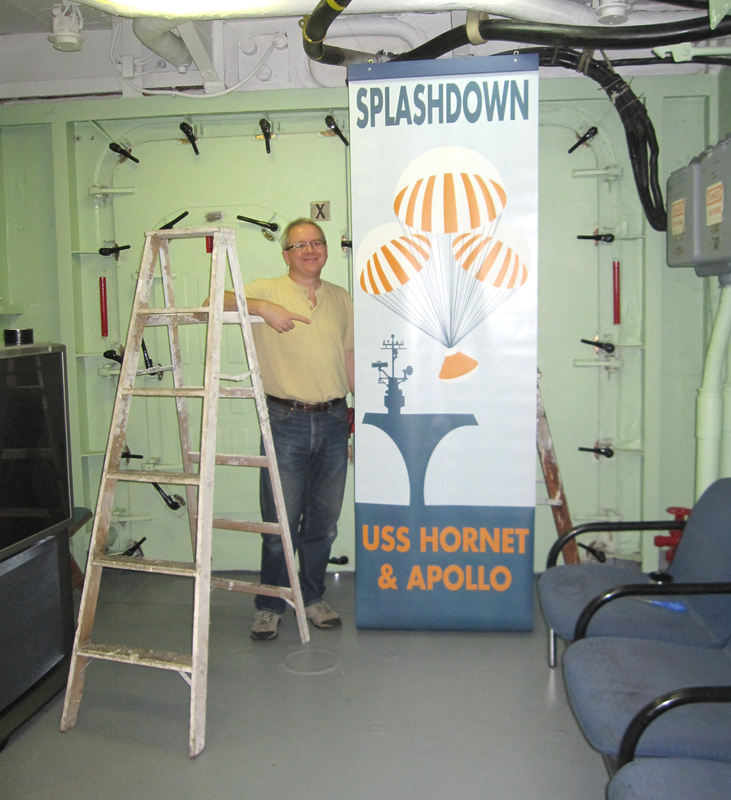 I designed the banner (based on the Hornet's mission patch for Apollo 12) to lure visitors in from the Hangar Deck. Four seats to the right give a restful view of historic Apollo news coverage looping on the TV at left. An 8-foot model of a Saturn V rocket will go about where I'm standing. 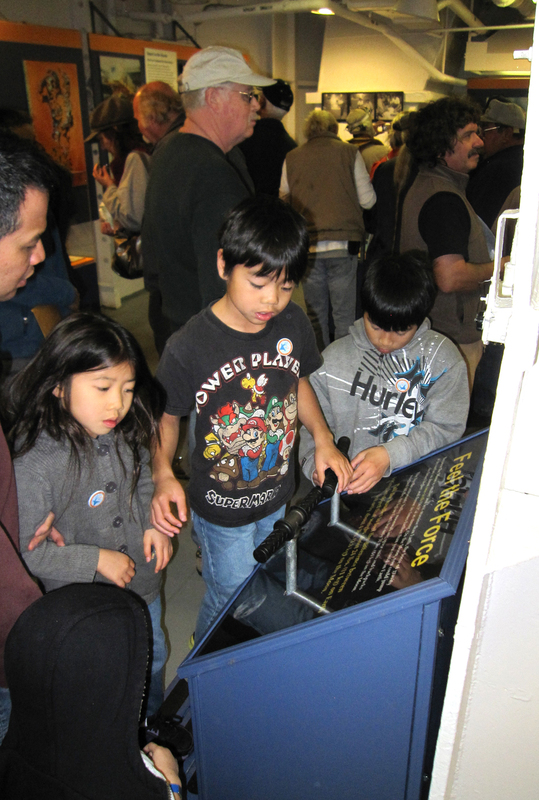 The bulk of the exhibit lies through a passageway to the left of the TV. 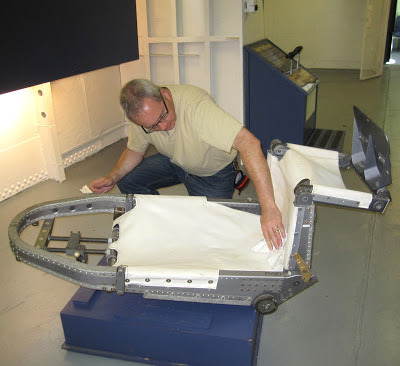 ...which was astronaut Tom Stafford's Command Module couch on the Apollo 10 mission! I include this photo only to permanently document the day I dusted cobwebs off a spaceship chair that flew around the Moon. Flew. Around. The. Moon. No, I did not sit in it. Laura with her co-worker, Curator Chad, and a partially completed portion of the Apollo Exhibit. Among Chad's many invaluable skills is driving a forklift. It was a skill we used often. We didn't get everything done last weekend. 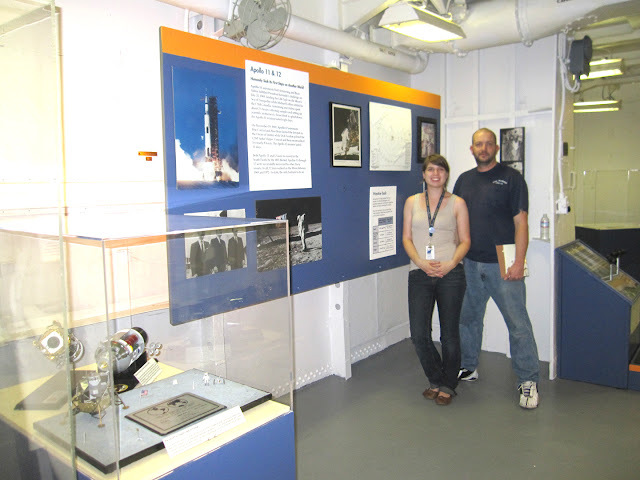 Laura and Chad have a few more days to work on the Apollo Exhibit before its grand reopening next weekend during shipwide activities in remembrance of Neil Armstrong. It'll be tight, but I'm confident they'll get it done. I know it will be well-received by the Hornet's staff, board, advisors and visitors. Can't wait to see it! I hate recommending things to people. It's an uncomfortable responsibility. What if they try my favorite dentist/barber/restaurant and hate it? What if they read a book or see a movie I recommend and not only hate it but think I'm an idiot for loving it? I'd feel like I owe them their money back. Maybe do some chores around their house to make up for it. Still: here are some low-cost, low-risk things I'll go out on a limb and publicly vouch for, with the understanding that tastes differ and caveat emptor. After five years of work, Cameron Stewart has finished his Eisner-Award-winning webcomic Sin Titulo. 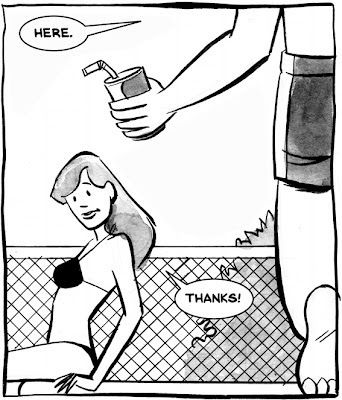 I would've been reluctant to recommend it before, since Stewart took a few very long breaks from the comic to do paying work, but now that it's complete I can do so enthusiastically. "Sin Titulo" isn't for everyone--there's some gore and nasty language in its 160 fast-paced pages--but I began following this noir horror mystery a few years ago and it became one of a few bookmarks I religiously clicked even when months passed between updates. Sin Titulo follows Stewart's young hero Alex as he visits his grandfather in a nursing home, learns that he died a month earlier, goes through his effects, and finds clues to a mystery that lead to a beautiful young woman, a brutish thug who is probably a little more (or less) than human, and a peaceful beach that seems to be accessed, Matrix-like, via telephones and radios. Alex becomes a classic man-on-the-run wrongly accused of horrific crimes, while at the same time trying to figure out how he's managed to thoroughly screw up his life. Honestly, I'm not sure if Stewart's climax actually explained everything--or anything--but I don't mind ambiguity and found the story very satisfying. My pal Mike Lynch and three of his cartooning compadres recently published the third issue of their 16-page comic book Raconteur, whose mission statement is "True stories from cartoonists who don't usually do this type of thing." 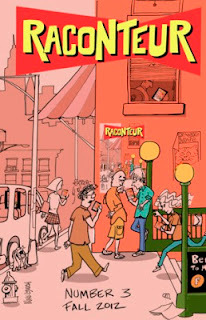 I'm cheating a bit, since I reviewed an earlier issue of Raconteur back in June, but Mike, David Jacobson, John Klossner and Jeff Pert--all single-panel cartoonists whose work appears in top magazines--keep putting out good work so I have no problem continuing to recommend it. 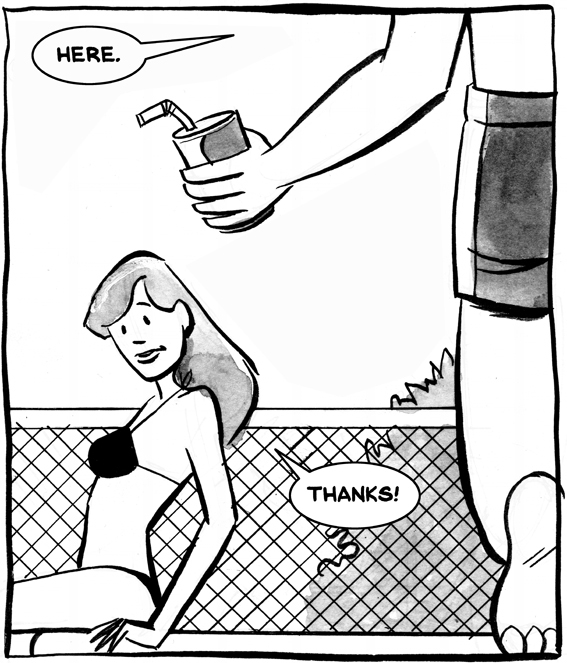 Each issue has four four-page slice-of-life stories with humor and heart. All three issues are available here. I admit I feel some warm fuzzies giving a few bucks directly to artists whose work I enjoy as encouragement to keep making more. If they offered subscriptions I'd subscribe. I'm also cheating a bit in recommending this next work because I haven't seen it yet. But I have faith. My friends MK Czerwiec and Mita Mahato, both cartoonist/artists I got to know through our graphic medicine conferences, have published a zine titled Ivy. They've set up a blog about it here and an Etsy store here. In addition to work from MK and Mita (who does wonderful multimedia storytelling with paper cutouts and such), this issue contains a piece by our mutual friend Sarah Leavitt, author of the graphic novel Tangles. What especially interests me about Ivy is that MK and Mita were inspired to create it after studying their way through Ivan Brunetti's book Cartooning: Philosophy and Practice. They figured the only way to really know if Brunetti's book was any good was to see if they could follow it to actually make a comic. They assigned themselves homework, shared their results, and put out a book. That's wonderful! As I say, I don't even know what's in it, but I know the people and they deserve some support. Just look at that spaceship on the cover; that beauty's worth a couple of bucks by itself. Someone taking all three of my recommendations would be out less than 11 bucks (Sin Titulo is free, each Raconteur is $5.99, and Ivy is $4.50). Even if my taste stinks and you hate them, you'd be fortifying your karma. I don't give refunds. 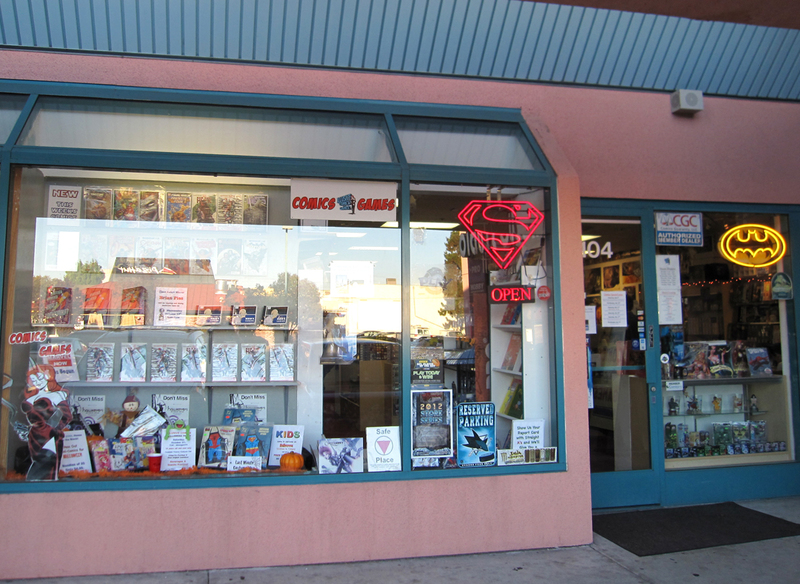 Storefront of Illusive Comics & Games. If you look closely, you can see a row of my books in the window announcing the signing. Nice promotional hustle! You never know what you're gonna get at a book signing. Some writers are guaranteed to draw a crowd out the door anytime and anyplace; I am not one of them. I've never had literally nobody show up, but I can't remember an instance when a line at my table was any longer than, oh, say, three deep. The nice thing about being unpopular is I get the opportunity to really spend time talking to my readers, who are often passionate about my work (true for both books, which makes for some challenging gear-shifting) and smart, interesting people. 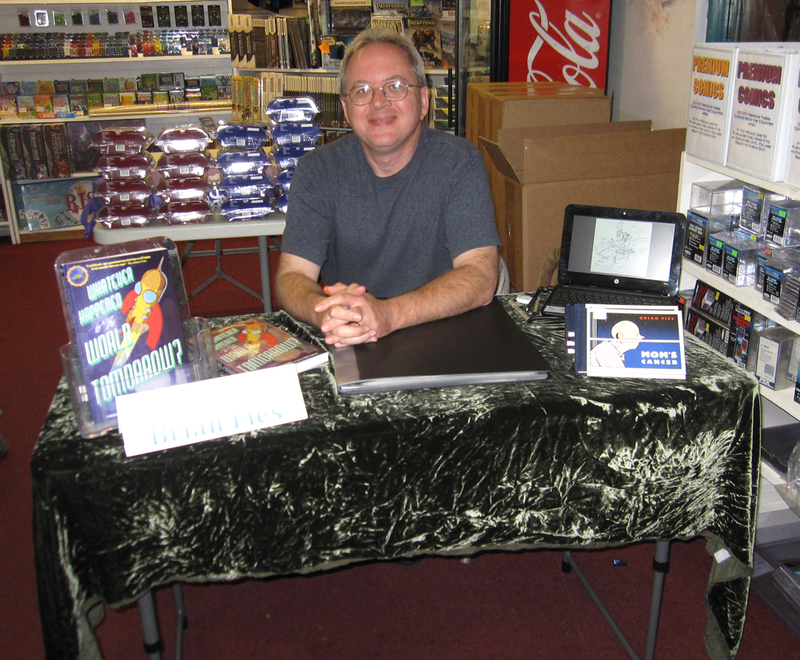 In light of that experience and standard, Wednesday's signing at Illusive Comics & Games in Santa Clara, Calif., was a very good one. 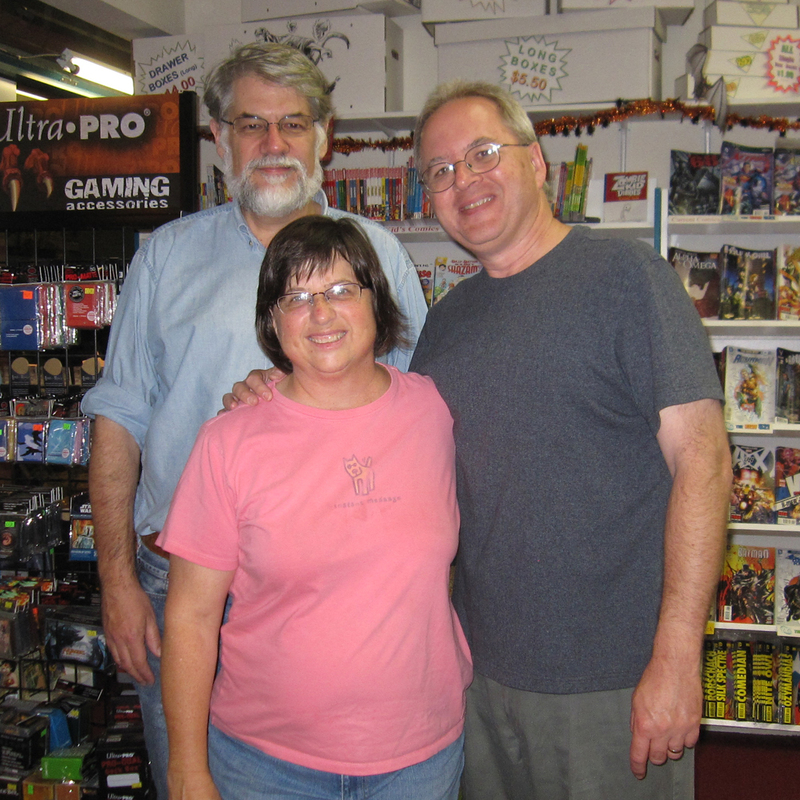 Owner Anna publicized the event well both online and on site, managers Perry and Steve were fine and friendly hosts, and we sold about equal numbers of my books to folks who seemed happy to be there. 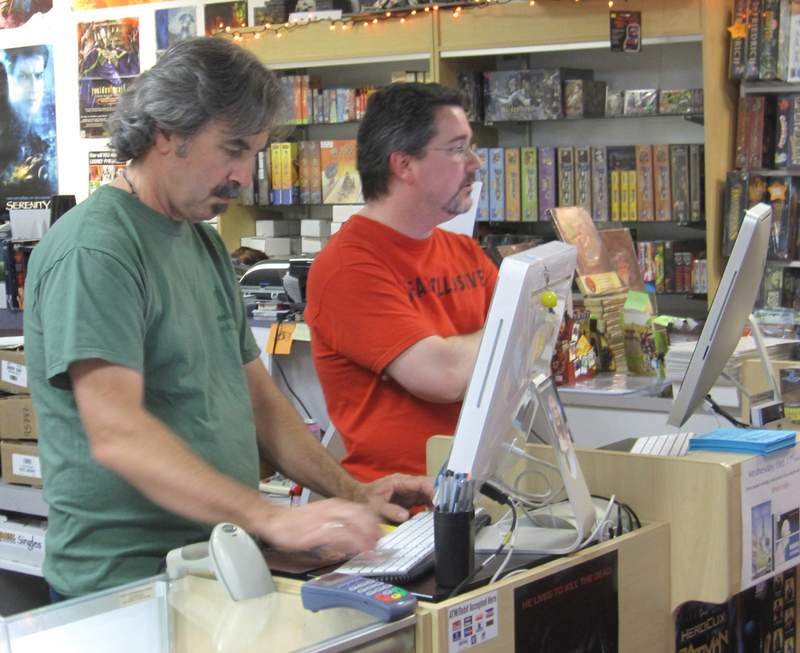 Wednesdays are when the new comics arrive, so they had a steady stream of regular customers coming in to pick up their weekly fix. 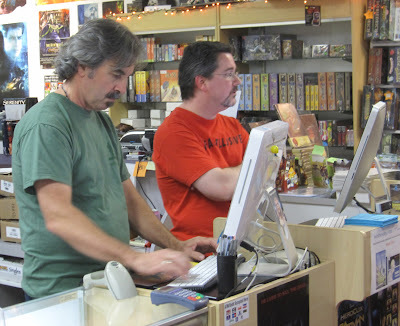 At the same time, half the store was turned over to gamers who huddled around three or four tables in the back. The joint was jumping. Steve and Perry took good care of me. If you put their names together you get the lead singer of "Journey." They're probably sick of hearing that but I just figured it out. They set me up right inside the front door. When I didn't feel I was getting enough attention, I could stick my feet under the table and trip customers as they came in. I finally met Tim Schmidt, who corresponded with me about WHTTWOT and shot some photos of my book posed in the offices of his employer, Intel (I'm not seeing an obvious way to link to those photos, so you should go "Like" my WHTTWOT Fan Page on Facebook and then find them in the "In the Wild" Album yourself). 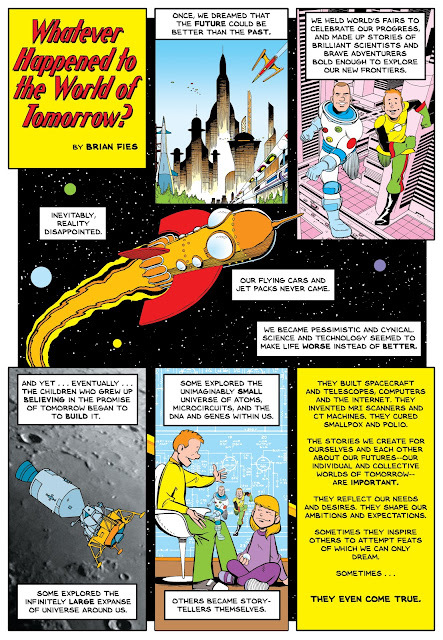 Tim designs microchips, helping make all our Worlds of Tomorrow come true. 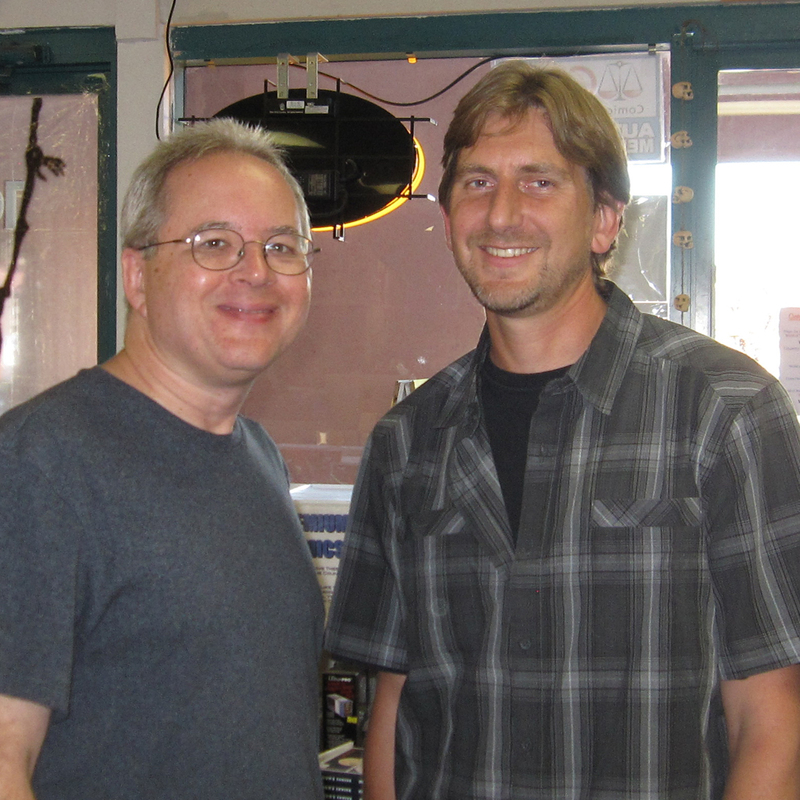 In fact, he worked on the very Pentium chip I used as the basis of my Future Superchip in the last chapter of the book. That's cool! Tim is a friend I'd never met in the flesh (funny how many of those we all have these days), so I really appreciated him coming by. Also surprising me were my friends Tina and Walter, with their son Kevin and service dog Loken. Tina and I became friends in college when we lived on the same dorm floor our freshman year. That was way back in the 20th Century. We both graduated, went our ways, lost touch, had careers and kids, and then reconnected through Facebook a few years ago. It was terrific to see them again. With Walter and Tina. I didn't know Walter 30 years ago, but I bet he's changed a lot since then. Tina hasn't. As much as I enjoyed seeing Tim, Tina and Walter, in addition to meeting new folks like John, Adam and Al, the night's highlight for me was being surprised by my daughters. 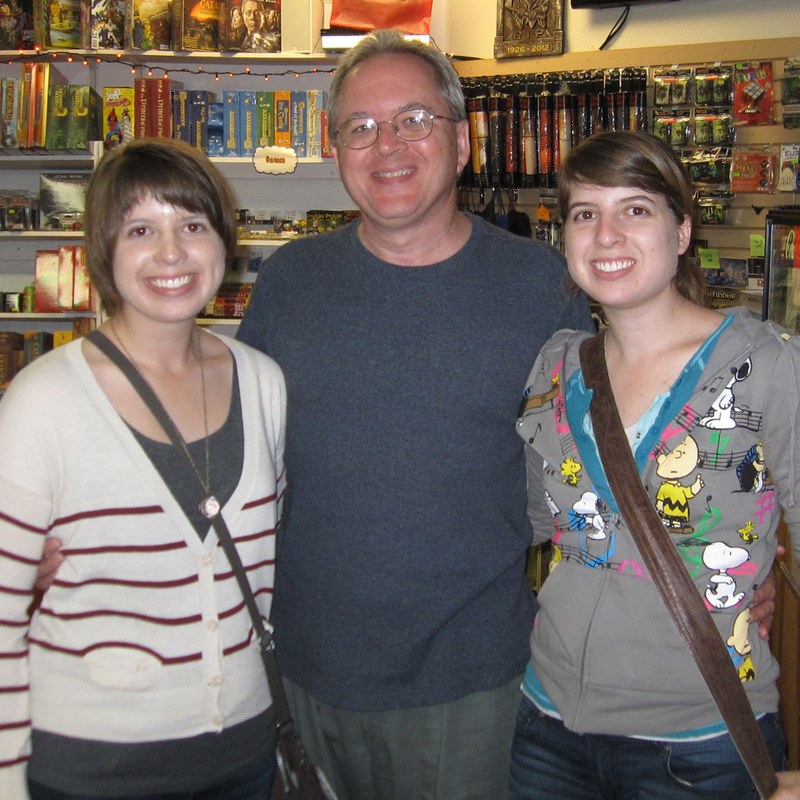 Robin and Laura live about an hour away in San Francisco--in fact, I'd just taken them to dinner the night before--but they had some family business in the South Bay and came just to see the bafflement on my face as they walked through the door. Bafflement achieved! Robin, me and Laura: Three-fifths of the WHTTWOT creative team (you may recall that my girls and two of their friends did a lot of digital coloring for me). I approve of Laura's sweater. My thanks to Anna, Steve and Perry (now I'll have "don't stop...believin'..." stuck in my head all day), all my friends and family who came by, and especially all the people I didn't know before who came by. I'm grateful! I don't get out much, so I'm looking forward to next Wednesday, Oct. 17, quite a bit. Anna, the nice woman who runs Illusive Comics & Games in Santa Clara, Calif., invited me to sit and sign in her shop so that's what I'm gonna do between 4 and 9 p.m. Address is at the link above. There's no speech planned. I expect to sit at a table and talk to friendly customers as they drop by to pick up their weekly periodicals (Wednesdays are when new comic books are delivered, which is why Illusive is open until 9 and Anna thought it'd be a good day for me to come by). I'll have a little slide show looping on my laptop and some original artwork from Mom's Cancer and WHTTWOT on display, and probably draw sketches for anyone who buys a book or casts big puppy-dog eyes my way. Mostly I look forward to just talking with staff and folks who know and love comics. Santa Clara is about two hours from home and farther than I'd usually want to drive for something like this, but next Wednesday and Thursday I happen to be attending a professional conference for my day job that takes place 10 minutes from the shop. Serendipity! Thanks to Anna for the invitation! I can already tell by how she's handled the book ordering and publicity that she runs a great shop and I'll have a good time. And if anyone reading this in the San Francisco Bay Area (especially the North Bay) ever wants me for anything, all you need to do is ask. I'm shamelessly easy. "Sometimes I turn around real fast to see if I'm being followed by an older time-traveling version of myself. 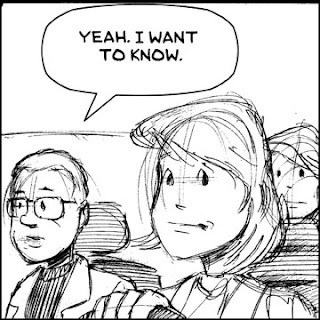 Of course, now I'll be expecting that move..."
These comics are silly spontaneous fun for me to write and draw, and some folks seem to enjoy 'em. Plus, they're all totally true to life, or will be assuming I invent a time machine and set out to meddle with my past dressed like Marty McFly in "Back to the Future 2." Like all the best characters in all the best memoirs, the girl is a composite. If you're a woman who knew me between the ages of 13 and 19, and wonder if she's you, the answer is Yes. 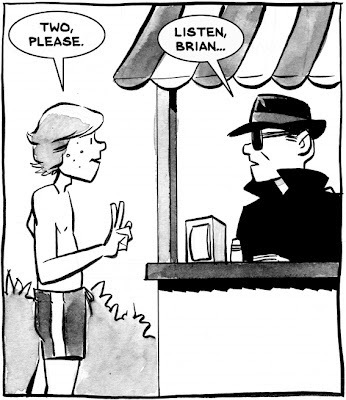 I've been mulling over the idea of collecting the Adventures of Old Time-Traveling Brian in a 'zine, which is a deliberately home-spun comic printed, folded and stapled on the kitchen table. 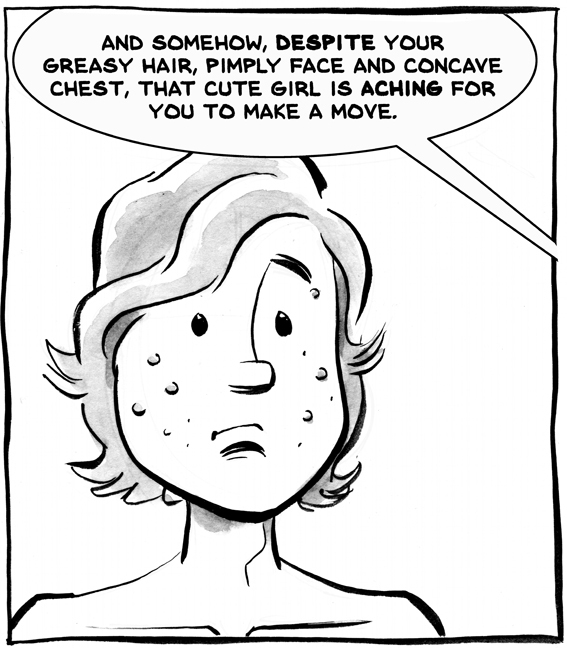 Nothing fancy--in fact, "fancy" is the antithesis of the 'zine aesthetic. Maybe a very small print run, signed-and-numbered limited edition, sold at a price that'd cover expenses. Maybe a little exclusive bonus material. Any interest in something like that?